Home » Climate change » Could both sides – and plans – work hands in hands ? After the Pickens Plan and Al Gore’s presentation which occured last week, I am wondering if both could merge in order to propose America a really comprehensive project. Politics are nice, but too much of partisanship can seriously hurt both people and the economy. I am not alone believing this as the IHT published a most interesting article on this very topic. If both teams are proposing to work toward a better future for their fellow citizens by using the exactly same means, why couldn’t they work hands in hands ? If necessity really is the mother of invention, gasoline at $4 a gallon will force the United States, the world’s most profligate user of energy, into a new era of creativity and innovation – as long as America’s leaders stop practicing politics as usual. “Our problem has been a monumental lack of leadership,” said Chris Jarvis, president of Caprock Risk Management, a company that advises investors on energy. “There’s a golden opportunity now to bring change. And oil at $140 focuses the minds.” So does $4 a gallon of gas – in a way $3 a gallon never did. As far as America’s energy habits are concerned – the United States has 4 percent of the world’s population and uses almost a quarter of its oil – change is under way. For one, the car culture is changing. Americans drive less and use more public transport (its use is at a 50-year high). Gas-guzzling SUVs are out, hybrids and fuel-efficient cars are in. (…) Transportation accounts for almost 70 percent of the 20.7 million barrels of oil the United States consumes every day, and changes in driving habits are a side effect of high gasoline prices. Another unintended consequence: reduced emissions of carbon dioxide from vehicle exhausts, the largest contributors to global warming. Americans are the world’s biggest emitters of carbon, with around 20 tons per person per year. Over all, China, with a population of 1.3 billion, has overtaken the United States as the world’s worst polluter. It accounts for 24 percent of global carbon dioxide emissions. The United States is second, with 22 percent. (…) This is not an addiction that can be cured by lifting an executive order (first imposed by Bush’s father in 1990) that banned drilling for oil off the Atlantic and Pacific coasts. 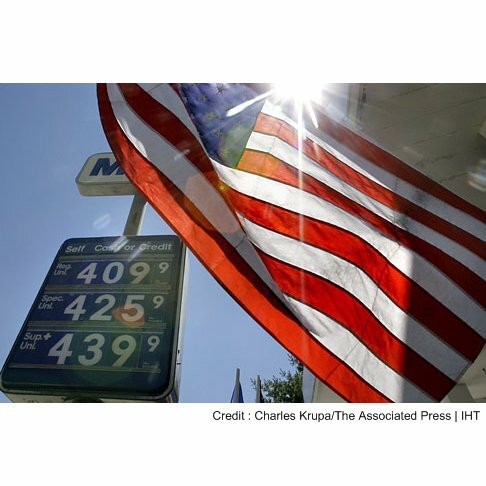 When Bush ended the ban this week, he portrayed it as a major step toward energy independence. Politics as usual in its purest form. Pickens’ plan is not the only one addressing energy problems, but it is the most intensely advertised. Come election time in November, his 80-year-old face is likely to be as familiar to TV viewers as the faces of the presidential candidates. (…) The plan is not as straightforward as it sounds: The government would have to build new power-transmission corridors from America’s midsection to the coasts. Fewer than 150,000 vehicles in the United States currently run on natural gas, and filling stations dispensing it are few and far between. Minor details for a country that prides itself on its “can-do” attitude. If it isn’t the always same war – left wing against right wing and their respective ideas and ideologies – what can prevent from both sides to work together ? Both projects plan to use clean and low carbon alternatives to give the United States of America part of its energy independence. What do you think about this ? Am I being idealistic ? I think it could work as, in France, socialists are part of the Sarkozy government and it is working almost perfectly fine. Well that about sums it up. And that’s why I’ve – unknowingly – been waiting for Gore. This could prove to be important over the long haul on who we’ll be looking to primarily. Indeed, I hope they Gore and Pickens won’t be competing, but instead figure out how they both would fit best in the larger picture. In The Netherlands, I’ve often heard remarks about why Clinton and Obama didn’t cooperate from the start. Well, I think this never was possible, because the US presidency is still considered a “race” to be “won”. But I think this energy is different. If Gore and Pickens are both truly committed to improving American and the world, than they’ll figure out how they can complement each other. If this would happen, we might be looking at the emergence of strong world leadership really fast. I hope to see Pickens and Gore appear besides each other on stage soon. Many thanks Meryn for your comments. I agree with you, Al Gore fills up a hole of the leader we had been waiting for. Me too I look forward to see Pickens and Gore together on the same video… That would be a huge signal for Americans and us all. ← Can the USA get 100 % of their electricity by clean energies ?